WHEN IS THE BEST TIME TO PLAN A TRIP? The easy answer is whenever you can. The reality is that the “best time” totally depends on your interests and the whims of nature and the fish. In general, there is always some good fishing going on from late May to mid October. Within that period, timing is everything. Kings run from May through July with peaks typically in mid to late June and mid to late July. Sockeye run from June through mid August with peaks in mid to late June and mid July to early August. 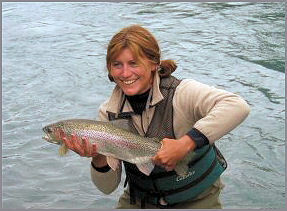 Silver Salmon for the fly-fisher are best from late August through October. Some years, the best fishing days for salmon might actually be before or after run peaks as weather and water conditions dictate the bite. There are always a few Dolly Varden in the river, but their numbers increase in July and peak during the Sockeye Salmon spawn from mid August to mid September. Rainbow Trout are always our game and we fish for them every day from June 11 until we decide to quit in October. Big fish can be caught anytime, but catchable numbers increase during the fall salmon spawning period. On the Kenai, our weather is typically driest in May and June and we pick up more precipitation and clouds as the summer turns toward fall. First time travelers typically plan to visit from mid June to mid August to take advantage of the summertime window. Month by month seasonal preview starting with June and linking through October. 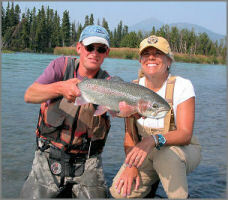 The Upper Kenai River is the premier drive to trout fishery in south central Alaska. We will float a stretch of this wild and scenic river between Kenai and Skilak Lakes, pursuing Rainbow Trout, Dolly Varden, Sockeye and/or Silver Salmon. Our goal is always to fish the most productive water and that often includes the Canyon stretch. The Middle Kenai River (actually the beginning of the Lower Kenai below Skilak Lake) offers some fantastic fishing for trophy trout and salmon periodically throughout the year. We motor our drift boats from the Lower Skilak Lake landing to the outlet of the Kenai River and target the hot zones from the Lake to Bing's Landing 12 miles downstream. The Lower Kenai is the most famous trophy King Salmon destination in the world. It is a very busy place when the Kings are running, but it is “the place” to find trophy sized salmon. The Kasilof is a smaller river offering high success rates for Kings. A drift on the Kasilof is an excellent choice for anglers wanting to catch a King Salmon in May or June. WILL WE BE FISHING FROM THE BOAT OR FROM SHORE? Your preferences are taken into account. Things like water levels, fish holding locations and species targeted will also dictate our approach. Fly-fishing trips generally spend a significant portion of time wading. 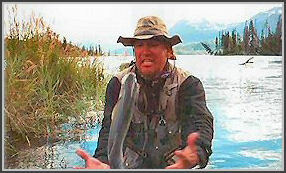 Sockeye Salmon are best taken by wading shorline runs. King Salmon fishing is typically done entirely from the boat. We generally wade several key areas each day for rainbows and dollies. We also regularly hook both during the drift between spots. We feature custom “Willie” and “Fish Rite” Drift Boats with comfortable seating for four anglers. Drift boats provide quiet comfort and are the absolute best watercraft for drifting rivers. WHAT ABOUT BEARS AND BUGS? 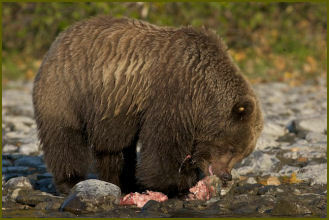 Brown (Grizzly) and Black Bears are common in the Kenai National Wildlife Refuge, but have never caused us any harm. They are most likely viewed very early in the morning or late in the evening as they search for salmon. We always look forward to viewing bears and will conduct ourselves in such a way as to avoid a negative encounter. We are very fortunate not to have a big issue with bugs. Mosquitoes are seldom a factor on the river. In August and September, we sometimes experience some little black flies, locally known as “white sox”. Bring some insect repellant if you are concerned. Weather seldom affects our trips; however, COMFORT is the key to enjoyment in the outdoors. We are sometimes blessed with warm sunny days, but be prepared, for cooler weather. We are located adjacent to several of the world's largest ice fields with the Gulf of Alaska nearby. The weather can be unpredictable. There is plenty of space in the boat to store extra clothing. Trips operate rain or shine so guests should bring quality raingear. CAN A NOVICE CATCH FISH? Yes, a novice can catch fish with a fly rod. We have taken some anglers fishing for their very first time. The guides are patient and capable of working with anyone who has the desire to catch a fish. We often say that the great thing about beginners is that they have no bad habits. CAN AN EXPERT BE SATISFIED? Our guides know the water extremely well and can offer some unique tips and techniques. Our goal is to provide you with the best fishing trip possible given the present conditions. We’ll provide as much direction as you wish and work you through the best water. We have successfully taken many children fishing. Trips with children work best when a family fills an entire boat. This ensures that your guide can be flexible and accommodating to your needs throughout the trip. We feature top-notch fly-fishing tackle. Spinning and casting outfits can be made available by request, but are not necessary for success. Our custom flies and terminal tackle are also included. On Full Day trips, we’ll bring a thermos of fresh coffee and a jug of cold water. We have some hip boots in men's sizes 6-12, though it is recommend that fly-fishing guests bring waders if they have them. We strongly support "catch and release", but will happily fillet salmon you retain and direct you to processing businesses. FISHING LICENSES are required for anglers 16 and older. Please plan to purchase your license ahead of time and be sure it is current. Note that fishing for King Salmon does require an additional stamp, but you will not be fishing for King's on the Upper Kenai. Also plan to BRING FOOD and beverages as necessary to keep you fueled throughout the day. FISH PROCESSING such as vacuum packing, freezing and shipping as well as other custom processing services are available locally. Be sure to bring your camera/video camcorder, polarized sunglasses, binoculars, brimmed hat, quality raingear and extra warm layers. For those that have them, we recommend you bring your waders and fly-fishing equipment. ARE THERE LOCAL ACCOMMODATIONS AVAILABLE? The answer is yes. Mystic Waters offers a premium rental house on Stacy Corbin's Kenai Lake property. Additionally, Cooper Landing features the Kenai Princess Lodge as well as a motel, cabins and B&B options. Mystic Waters is happy to arrange your stay. Cooper Landing is conveniently located about an hours drive from Seward or Soldotna and approximately 2 hours from Anchorage. Upper Kenai trips depart from Cooper Landing. Middle Kenai trips meet in Cooper Landing or Sterling. Lower Kenai and Kasilof trips meet in Soldotna. We typically use one of three landings in the Cooper Landing area or a couple more near Sterling. Guests are asked to call in (907-227-0549) a day or two in advance of their trip date to confirm departure location and time. I WANT TO KNOW MORE ABOUT THE FISH. I WANT TO KNOW ABOUT FLY-FISHING TACKLE NEEDS.